Routine dental cleanings are the heart of what we do and the first step towards building a foundation of good oral hygiene. Following the American Academy of Pediatric Dentistry (AAPD) guidelines, your child should visit the dentist every 6 months or sooner, depending on their individual dental health needs. A child’s first dental appointment should be scheduled at the eruption of their first tooth or by their first birthday, whichever comes first. This appointment is designed to move at your child’s pace and is dictated by their comfort level. We understand that your child may not be comfortable with all of the services recommended during a routine cleaning appointment, and that’s ok! 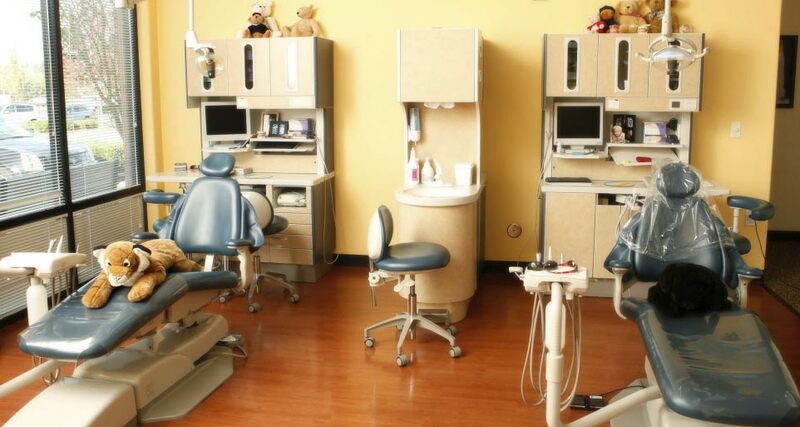 Our doctors, hygienists, and staff strive to connect with your child, and to achieve a level of trust and security that will last a lifetime. In future appointments, we know there will be an established relationship that allows us to carry out all necessary procedures. Digital films of your child’s teeth help the doctor to determine if there is anything going on inside the tooth that needs addressed or noted. When X-rays are taken, we are not just looking for cavities or decay, but also any missing teeth, extra teeth, teeth that may be fused, or other abnormal pathology. Rest assured that when we take X-rays, we use state of the art digital films, which reduce the risk and exposure to your child. In fact, your child receives more radiation playing outside for 20 minutes than they do when they receive their routine dental X-rays. Fluoride plays an important role in the dental health of your child’s teeth. We value the benefits of fluoride and fluoride varnish, and we have seen these benefits in many of our patients. The AAPD recommends that those children who have a moderate or high risk for developing cavities take advantage of fluoride. It’s common for parents to have questions about the use of fluoride, and we welcome them! It’s very important that you and your child feel comfortable with the care received in our practice. For special circumstances, we also use silver diamine fluoride to help stop tooth decay. To learn more go to What Is Silver Diamine Fluoride? Dental sealants help protect the deep pits and grooves that naturally occur in teeth. In addition to brushing and flossing, sealants are another line of defense we have available to keep teeth healthy. We offer fissure sealants to all of our patients who need them to help prevent decay. We believe so strongly in the value of sealants that we will maintain your child’s sealant for as long as they are our patient. Cavities come in all shapes and sizes, and the need for a filling will vary depending on your child’s age, the location of the cavity, and how much longer the tooth is going to be in the mouth. Fillings restore a tooth that has been penetrated by infection, which has then caused a cavity. It’s important to address and stop the infection before it can cause further damage to the infected tooth or neighboring teeth. Sometimes infections can grow to a more systemic problem: penetrating and harming the bone, gum tissue, or developing permanent teeth. The child may find it difficult to eat, concentrate, or do their schoolwork. If your child is about to lose an infected tooth and it’s not causing them any pain or sensitivity, we may simply monitor a cavity instead of restoring it. Crowns preserve the integrity of a tooth damaged by a cavity that’s too large to be remedied with a filling. When a cavity is on multiple surfaces of a tooth or encompasses a large portion of it, a filling has a very high chance of breaking. In that case, a crown is needed. We primarily utilize stainless steel crowns because they are the most effective way to treat a large cavitation on a tooth, though we do offer both stainless steel and ceramic variations. Most parents prefer stainless steel because ceramic crowns require a very dry, clean field, and are more challenging to place when working with a young child. Occasionally and in special circumstances, we do offer the more aesthetically pleasing ceramic crowns. Keep in mind that baby teeth eventually fall out–usually by age 12–making the crown’s effectiveness our primary consideration. The tooth is made up of three layers: the outer layer is the enamel, the middle layer is the dentin, and the innermost layer is the nerve or pulpal layer of the tooth where the nerves and the blood supply live. As cavities grow, they can start to infiltrate the inner layers of the teeth. Depending on how deep the cavity has reached, the method necessary to treat the cavity may change. If the cavity is only in the outermost or dentin layer, a restoration filling is usually the treatment of choice. If the cavity is larger or covers more surface area, a crown may be needed. If the cavity penetrates the nerve layer, a pulpotomy, or sometimes a pulpectomy, is required to clean the nerve out and remove the bacteria. A pulpotomy cleans out the chamber of the tooth and the nerve. A pulpectomy cleans the nerve in the chamber, as well as the nerve in the canals. Once the area is clean, we fill it with a medicament that preserves the tooth structure and kills any remaining bacteria. We then restore the tooth with a crown, or sometimes a filling. Simply put: space maintainers hold space inside the mouth to allow for uncomplicated or uninhibited eruption of permanent teeth. Overcrowding inside the mouth. Baby molars are smaller than the permanent molars that will replace them. If there are indications that a child’s teeth may become overcrowded as permanent teeth erupt, we will insert a space maintainer for orthodontic purposes. This will prevent the drifting of the permanent molars, which will decrease overcrowding in the long-term. Children can lose baby teeth prematurely for various reasons, an example of which would be an extraction. When a child loses a tooth that will not be immediately replaced by a permanent tooth, we’ll insert a space maintainer to hold the space until the permanent tooth erupts. Doing this ensures the surrounding teeth stay put and don’t shift into voided area. There are two main reasons that a child may need a tooth extraction: stubborn baby teeth and infection. An extraction may also be necessary when a child has an infection in the tooth, but is not at the right age for a filling, crown, or nerve treatment. Particularly when the infected tooth is a baby tooth, it may make more sense to simply remove the tooth to make way for the permanent tooth. While extractions are an intimidating idea for most children, you can be assured that our dentists and hygienists will be mindful of your child’s needs at every step. We’ll make sure your child understands the process of the procedure, and we’ll only proceed when his or she is comfortable. We offer several types of sedation in our practice to aid in making your child calm and comfortable during their dental procedure. Prior to your child’s appointment, our doctors will have an in-depth discussion with you to determine the safest and best option to treat your child’s needs. For in-office IV sedation, we work with a board-certified anesthesiologist, Dr. Michael Bespaly, who comes to our office to administer the anesthesia and oversee its success during the procedure. This is a safe, effective, and cost efficient option for many patients, especially with two board-certified doctors present: the dentist and the anesthesiologist. Many people think of mouthguards as safety equipment needed in contact sports like football and lacrosse, and yes, they are certainly necessary when playing those sports. However, wearing a mouthguard is also important in other sports like soccer or basketball, as well as in everyday physical activities such as a riding a scooter, bicycle, or skateboard. A mouthguard should be worn during any activity that carries an increased risk of injury to the mouth and teeth. Preventing oral trauma is a worthy investment, both emotionally and financially. Generic mouthguards, such as those that you boil and mold, are often uncomfortable and can hinder your child’s ability to communicate when he or she is wearing the device. Custom mouthguards, on the other hand, provide the highest degree of protection and utility. Custom built using an impression of your child’s mouth, the mouthguards we provide fit snugly and comfortably, and provide effective protection during physical activity.